Tythis Ulen is a Dunmer citizen living in Riften and working at the Riften Fishery. He lives in the Bunkhouse. Tythis wears a set of farm clothes and a pair of boots. He is equipped with a leveled dagger which can be up to elven quality, and carries a selection of common loot and gold. He gets up early, at 6am, and eats breakfast at the bunkhouse for an hour. At 7am, he heads outside to work for the fishery, chopping and carrying wood by the docks for eight hours. When he's finished at work for the day, at 3pm, he browses the market for three hours. Then, at 6pm, he heads back to the bunkhouse to eat dinner and relax for six hours. Finally, at midnight, he heads upstairs and goes to bed. He seems to regret coming to Riften, complaining, "I'm beginning to think leaving Mournhold was a mistake." or "If Riften is the best Skyrim has to offer, I may as well turn back right now and just head for home." However, he seems satisfied with his job, saying, "Working at the Riften Fishery is tough, but it puts some coin in my pocket." When you're handing out pamphlets for the temple, he'll be intrigued, saying, "Oh, interesting. I'll read it this evening." Tythis: "Madesi, have you heard the Imperials might be headed this way? What would we do?" Madesi: "They aren't invading, milord... it's simply a response to Ulfric and his Stormcloaks. I assure you everything will be fine." Tythis: "But I've heard from the Snow-Shods that they intend to burn this place to the ground!" Madesi: "Tythis, please. The Snow-Shods are good people, but tend to exaggerate. Try and stay calm for your own sake." Tythis: "Brand-Shei... have you managed to find those boots for me?" Brand-Shei: "What's with all the boots and shoes you keep buying? You must have bought twenty pairs in the last two years." Tythis: "Always be prepared. You never know if you might get a split in one, or lose one, then where would you be? No sir, that's not happening to me." Brand-Shei: "Um... okay. Well, the boots aren't here yet. Hopefully on the next Khajiit caravan." Tythis: "Grelka, can you repair boots?" Grelka: "Leather? If they're armored, you should talk to Balimund over at The Scorched Hammer." Grelka: "Why in goodness name would you have... oh never mind, just bring them by my house later and I'll see what I can do." Tythis: "Marise, I've come to warn you that the Thieves Guild has been harassing shopkeepers again." Marise: "I've heard. Bolli and Keerava were speaking of it just a little while ago." Tythis: "I hope that doesn't mean things are going to get worse around here." Tythis: "Wujeeta, you can't keep showing up here late. Bolli's just going to get someone to replace you." Wujeeta: "No, no, no. I need this job! This is the last place in town to have work." Tythis: "There's always the Thieves Guild." Tythis: "Nothing, nothing. Just straighten yourself out before you find yourself headed back to Black Marsh." Tythis: "Hey, Svana... I hear you like Dark Elves. Perhaps I could should you what a real Dark Elf can do to you." Svana: "You're an animal, Tythis... keep away from me." Tythis: "Ah, so my reputation as a lover precedes me. Care to reconsider?" Svana: "You're disgusting! Don't you even think of laying a finger on me or I'll cut off something you can't live without." Tythis: "Niluva, you promised me you'd pay me back yesterday. So what's the story?" Niluva: "Just give me a few more days and I promise I'll come up with it." 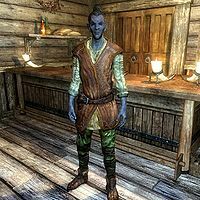 Tythis: "If you'd stop wasting your coin on that skooma, you'd have enough gold to live on." Niluva: "Sorry, Tythis. I'll get it to you somehow." Esta página foi modificada pela última vez à(s) 18h08min de 25 de setembro de 2013.